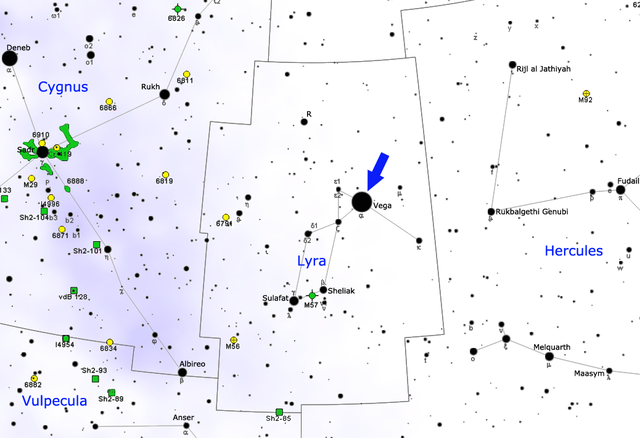 Vega, Alpha Lyrae, is the brightest star in Lyra constellation and the fifth brightest star in the sky. Vega is only fainter than Sirius in Canis Major, Canopus in Carina, Alpha Centauri in Centaurus, and Arcturus in Boötes constellation. It is the second brightest star in the northern celestial hemisphere, with only Arcturus appearing brighter. Vega can be seen from latitudes north of 51°S, but not from the southernmost parts of South America. For those living north of latitude 51°N, the star is circumpolar (it never sets below the horizon). Vega is one of the three stars that form a prominent summer asterism, the Summer Triangle, along with the bright stars Altair in Aquila constellation and Deneb in Cygnus. The star’s original name, Wega, was derived from a loose transliteration of wāqi‘, which means “falling” or “swooping” in Arabic and refers to “the falling or swooping eagle” or an-nasr al-wāqi‘. Lyra constellation was depicted as a falling eagle or vulture in ancient times in Egypt and India. Curiously, this gives Vega a “bird” connection with the other two stars of the Summer Triangle, located in Aquila (the Eagle) and Cygnus (the Swan) constellations. Vega belongs to the spectral class A0 V, which means that it is a bluish white main sequence star that is still fusing hydrogen to helium in its core. The star will eventually evolve into a red giant and later become a white dwarf. Vega has an apparent magnitude of 0.03 and is approximately 25 light years distant from Earth and the solar sytem. It is 40 times more luminous than the Sun, and one of the most luminous stars in the vicinity of our solar system, along with Sirius and Arcturus, which are also nearby (8.6 and 37 light years distant respectively). 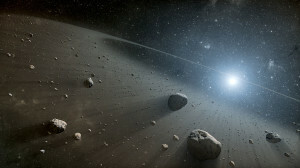 Vega’s estimated age is 455 million years, which is about a tenth of the Sun’s age. It is, however, 2.1 times as massive and its lifespan will also be about a tenth of the Sun’s, roughly a billion years. 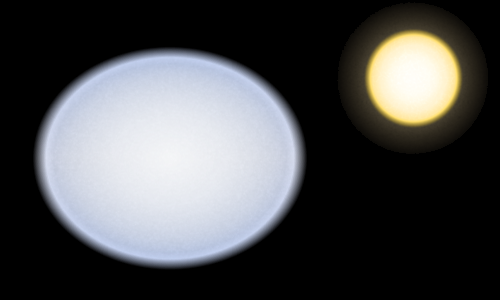 To a hypothetical observer in the Vega system, the Sun would appear as a dim star with a magnitude of 4.3, located in the direction of Columba constellation. Not counting the Sun, Vega was the first star to be photographed and have its spectrum recorded. It was photographed on July 17, 1850 by John Adams Whiple and William Bond at the Harvard College Observatory. The star’s spectrum was first photographed in August 1872 by Henry Draper. 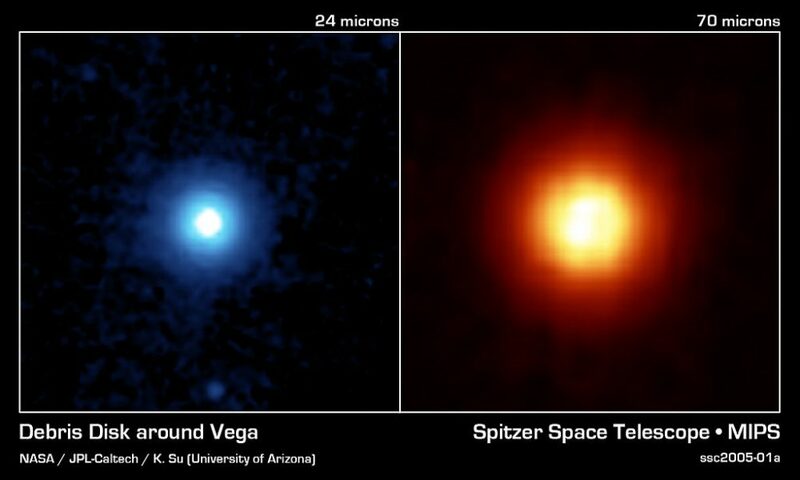 Among other firsts, Vega was the first solitary main-sequence star other than the Sun known to emit X-rays, and the first star known to have a disk of dust in its orbit. Vega shows occasional low-amplitude pulsations and variations in luminosity, and it is a suspected Delta Scuti variable. These stars, also known as dwarf Cepheids, show variations in luminosity as a result of both radial and non-radial pulsations of their surface. Vega is also a very fast spinner, rotating at a speed of up to 236.2 km/s at the equator, or 87.6 percent of the velocity that would cause it to start breaking up. As a result of centrifugal forces, the star’s equatorial region is bulging outward and the temperature of its photosphere is higher at the poles than at the equator. The star’s radius around the equator is 19 percent larger than its polar radius. The poles are also significantly brighter than the equatorial region. As we see Vega almost exactly pole-on, the star’s visual magnitude is higher when observed from Earth. If we saw it along the plane of the equator, the star’s luminosity would be roughly half the apparent luminosity as seen from the pole. 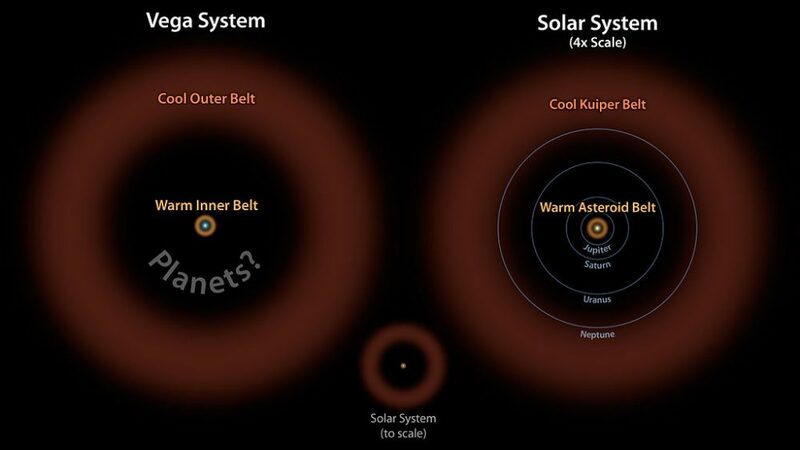 Our solar system is moving in Vega’s direction, at a speed of 12 miles per second, and Vega will become the brightest star in the sky in about 210,000 years, and its apparent magnitude will reach a peak at -0.81 in roughly 290,000 years. Once it reaches that point, it will be the brightest star seen from Earth for approximately 270,000 years. 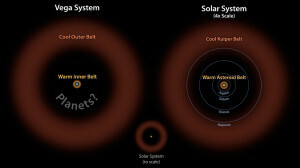 Vega has a circumstellar disk of dust in its orbit, and irregularities observed in the disk indicate that there is at least one planet orbiting the star, with a size comparable to that of Jupiter. Vega was the nearest star to the North Celestial Pole around 12,000 BCE and will take over as the northern pole star again around the year 13,727. The star is associated with the Lyrid meteor shower, which peaks around April 21-22 every year. The shower is also known as the Alpha Lyrids because the meteor trails appear to originate in the direction of Vega. The meteor shower, however, is not physically associated with the star or Lyra constellation. It really originates from debris left by the comet C/1861 G1 Thatcher.